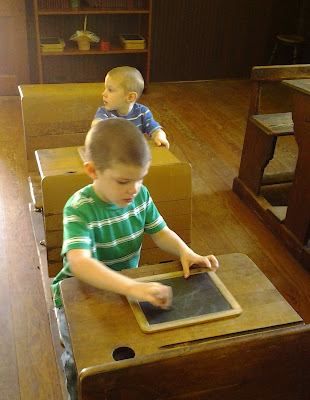 The school house at Living History Farms at the boy's first visit in September of 2012. Welcome to our weekly post about what's going on in the Des Moines, Iowa area. We'll share what we'll be doing, great finds, restaurants to eat at, shops to drop some cash at, and just all the great things Des Moines has to offer families. Yard work. This year we're doing the minis birthday party at home, which means we've got A LOT of weed pulling to do! A hike. Hopefully. Really, really hoping to get at least one hike in Brown Woods, but it looks to be a rainy weekend. CelebrAsian: Friday and Saturday in Western Gateway Park. Historic Baseball at Living History Farms. We've never been able to attend a historic baseball game at LHF but it's on our To Do List! Iowa Craft Beer Tour. This would make a great Day Date with the significant other. Pools open all around the Metro and surrounding communities--although it looks to be a rainy and cool weekend. The Adventures of Robin Hood. Saturday, 10:00 a.m. and 1 p.m.